This week's IF topic was "ripple". I did a cheerful interpretation first, but then I learned about the Ripple sketches project, which is raising money for helping the creatures affected by the Deep Water Horizon Gulf Oil Spill. The idea is that artists create a small artwork on the subject and the works are available through the Ripple project for a mere $10 donation to The Institute for Marine Mammal Studies or The International Bird Rescue Research Center. My art tends to come from a happy place, so I did not find a sad and depressing issue like the oil spill inherently inspirational. 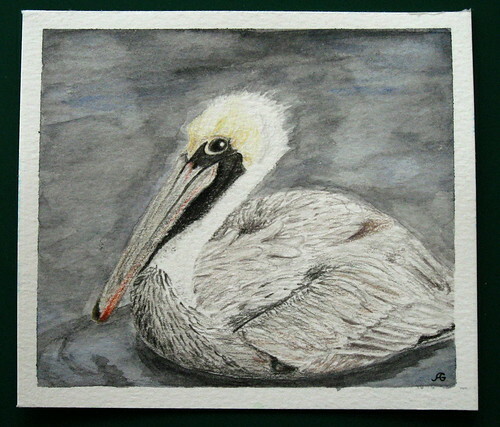 I wanted to contribute to the project, though, so I've done a watercolour and coloured pencil illustration of a brown pelican. The brown pelican is one of the creatures affected by the spill. If you want to help and get a piece of art in the mail, go see all the available works here. Hey! I love the idea of a Friday drawing idea! I used to draw all the time, and, for myself and my family, it was my decided career path until dance stole my heart. When I went pro, I dropped the drawing because all my creative energy was going into the dancing, and I haven't picked it up since. I'm starting to really miss it now, especially as my pregnancy is making me less mobile, and I'm finding myself inspired by the weekly challenge. What a great idea! I hope it'll lead me back into that love, and I can regain some or all of my skill. I'm enjoying your illustrations. Keep it up!